â€œThe pace of modern-day life, credit crunch, and financial crisis is making many people feel very stressed and so we have created this space to help them relaxâ€�, noted Professor Wiseman. â€œResearch suggests that the subdued green light enhances the production of dopamine in the brain and provide a calming sensation. 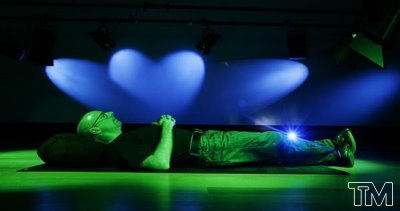 In addition, the artificial blue sky helps create a mild form of sensory deprivation that will help them turn their attention inward and distract them away from daily stress.â€� The music that will be played during each session has been specially composed by University of Hertfordshire Professor of Music, Tim Blinko. A few years ago, Wiseman headed an international study examining walking speeds around the world, and discovered that people are living more fast-paced and stressful lives than ever before. It is hoped that the room will help motivate different groups of people to combat stress, including, for example, students facing exams and businesses wishing to lower their employeesâ€™ stress-related absenteeism. The following questionnaire helps identify people who might be living life at a pace that exacerbates stress. 5 or more â€˜yesâ€™ responses suggest that it might be time to take your foot off the accelerator and slow down. 1.Â Do you seem to glance at your watch more than others? 2.Â When someone takes too long to get to the point, do you feel like hurrying them along? 3. Are you often the first person to finish at mealtimes? 4. When walking along a street, do you often feel frustrated because you are stuck behind others? 5. Would you become irritable if you sit for an hour without doing anything? 7. If you are caught in slow-moving traffic, do you seem to get more annoyed than other drivers? Being stressed can increase your blood pressure, affect your ability to concentrate, and weaken your immune system. 1. Head for the countryside. Research shows that spending around thirty minutes in green and quiet surroundings will make you feel significantly more relaxed. 2. Listen to soothing music. Listening to Vivaldiâ€™s Four Seasons, a relaxation tape, or nature sounds lowers your blood pressure. 3. Carry out a relaxation exercise. Starting at your toes and working upwards, spend a few moments slowly tensing, and then releasing, the muscles of each part of your body. 4. Spend time with friends. Being with people you like helps distract you from anxious thoughts and lifts your mood. 5. Help others. Research shows that even carrying out a small act of kindness, such as making a donation to charity, helps improve your mood and decreases stress. 6. Accept what you canâ€™t change. There is no point dwelling on the past, or thinking about what canâ€™t be altered. Instead, focus on how you can create a better future. 7. Smile more. Donâ€™t take life too seriously, and improve your ability to cope with stressful situations by seeing the funny side of whatever happens. 8. Use lavender. Research shows that most people find the smell of lavender especially relaxing, and that it also helps them get a good nightâ€™s sleep. 9. Hit the gym. Exercise promotes the production of endorphins, which, in turn, make you feel better about yourself and become more relaxed. 10. Look at the sky. If it is a nice day, lie on the grass, look up at a clear sky, and allow positive thoughts and images to drift through your mind. I personally use #2 (for some reason, 50 Cent’s music soothes me, especially his Get Rich or Die Tryin’ CD), #9 works wonders (been going to the gym on and off for years but have been EXTREMELY consistent for the past 2 weeks and I’m feeling good), and I’m currently working on #6. There’s no point in dwelling on my current situation which includes being a triple minority, I’m now focused on how I can make a better future as oppose to dwelling on the past. Great post.